Polish the Bakelite! All the Bakelite! The time has come, my little friends, to polish other's things! And make your bracelets bright and fresh - a collection for a queen. Brighter Bakelite is going to start professionally polishing YOUR Bakelite. It will be finished as completely and professionally as the pieces offered in our Etsy shop. At first, we will take only smooth surface bangles that are round (not oval). 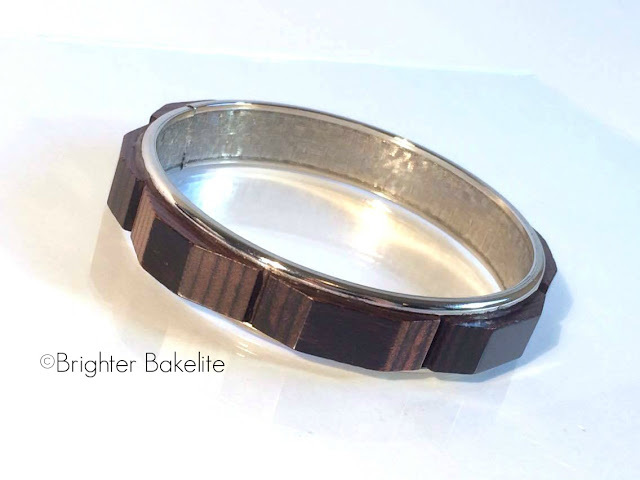 These will include inlays of Bakelite or wood, including dot inlays, and laminates with a smooth surface. We will not be taking faceted or carved bangles, or inlays of other materials, such as metal or rhinestones at this time, but will do so in the future. Anti tarnish bags will be sent to keep them brighter longer. 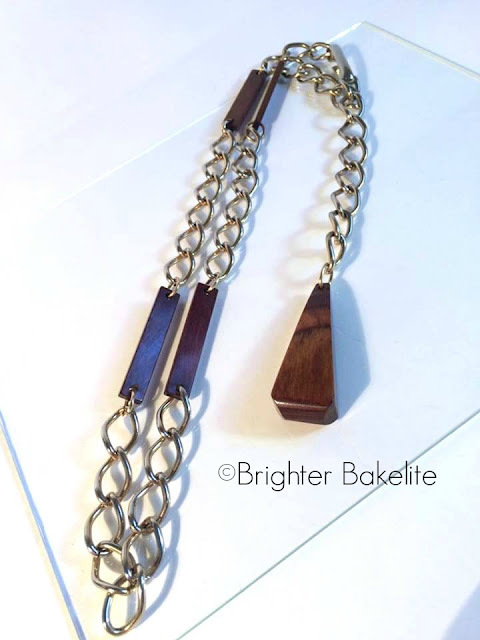 Please send us an email at brighterbakelite@gmail.com if you are interested in this service. Upon receipt, an estimate will be provided and work will commence once you have confirmed your polishing price. Upon completion you will be sent a PayPal invoice to the email address provided on the form. Turn around time is estimated to be 1- 2 weeks. All of this is subject to change, and the contract signed will always be honored. This is a service for our customers. At this time, we are only accepting pieces from private collections, not intended for resale. We ask resellers to respect this. If we find that pieces completed through this service are being sold through Etsy, Ebay or other venues we will will regretfully discontinue this service. Thank you for being such great and respectful customers! Those pieces that look like wood, but feel and even smell like Bakelite. 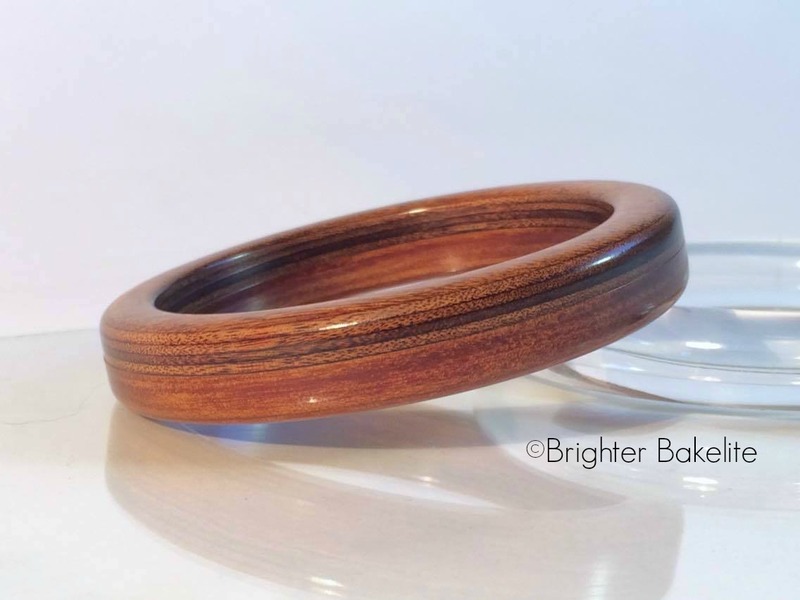 Maybe you have heard that they are Bakelite treated to look like wood.. They are wood that has either been impregnated with Phenolic resinoid and laminated, or that has been just laminated with it. In a career in antique furniture reproduction and helping to build a wooden Yacht form the keel up, I had learned a lot about woods, and about treated woods. That sparked a curiosity about impregnated woods back in the early 1990s. 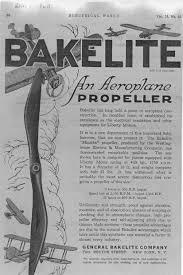 I was fascinated with airplane propellers that were as hard and smooth as stone, and laminates that were smooth all the way through, even when cut. At that time, I was interested in Bakelite, and had a few pieces, but never put the two together, per se. 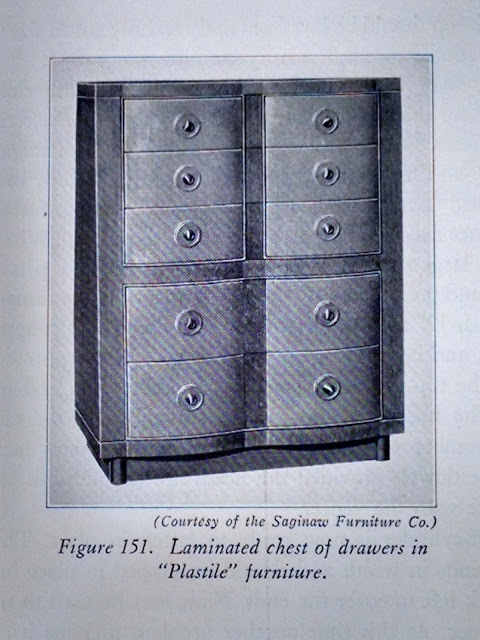 With the woodworking experience, I knew how to research, and what to look for to get my answers about the collection of about 50 pieces of Wood/ Bakelite laminates I have. If you have read about the history of Bakelite, you may remember that the first viable formula was wood soaked in the formula. Mr. Baekeland tried it because the first formula was too brittle. 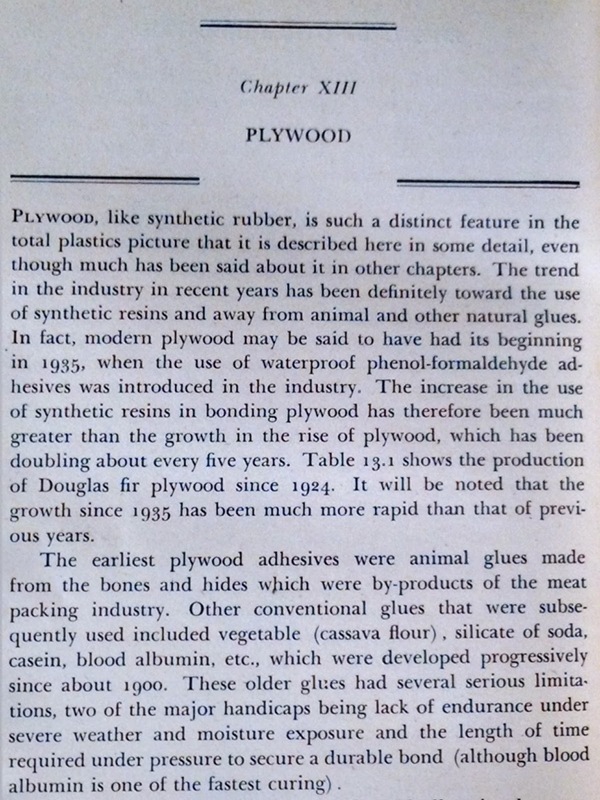 I will let the books I have on the subject tell the story of Phenolic wood laminates. This information is comprised from books I own from 1939, 1941, 1942, 1945, 1946, and 1948, and will be in quotes. Yeah.. they used to use BLOOD! Now, we can say that Phenolics are humane! "Plywood is built up of layers or thin slices of wood called veneers, glued together with the grains alternating at right angles. The layers of this type of plywood generally separate when exposed to moisture. The difference between a plastic laminate an an ordinary plywood is that the core material (wood veneers, paper, linen, etc..) is impregnated with resin so that this is continuous right through, not just a glue line. Several companies now manufacture a synthetic resin adhesive which is used in the bonding of plywood. The most common resin adhesives for bonding of plywood are the Phenol-Formaldehyde and the Urea-Formaldehyde adhesives. In the manufacture of laminated sheets, the base layers are first saturated with a liquid resinoid, or they may be sprayed with a resinoid surface coating." "Once the sheets have been impregnated, they are arranged in stacks of the necessary size to produce sheets of the desired thickness." Dresser most likely finished in Mahogany. "Poplar, Birch, and Spruce, Avodire, Maple, Walnut veneers, low in natural resin content are being employed in the development of resin bonded structures. In some outside facings, Mahogany veneers are employed for hardness. Thickness of veneers range from 1/48" to 1/8". " "Laminated Plastics is made from superimposed layers of fibrous or porous sheets coated or impregnated with resinoid and becomes a solid mass by the application of heat and pressure in a large hydraulic press. Up to 8X20 feet Heat is usually applied through steam platens on the top and bottom and top of the stack, but sometimes dielectric heat is used. A typical press may produce sheets 3' X 8' in size and a variety of thickness varying from 1/16" to 1" or more in thickness. A total pressure of over 5 million pounds may be exerted by the press. Laminated plastics forms have an advantage over the other plastic forms in that they receive the benefit of mechanical reinforcement from the laminations; then, too, they possess the insoluble and infusible properties of the resinoid binder. By varying the process of manufacture, a laminated sheet may have the appearance of the non plastic layer, (such as wood or canvas). They serve to broaden the scope of plastics in the styling of numerous machines and accessories. They are easily kept clean and maintain a permanence of finish that exceeds even the qualities of other surface coating materials. 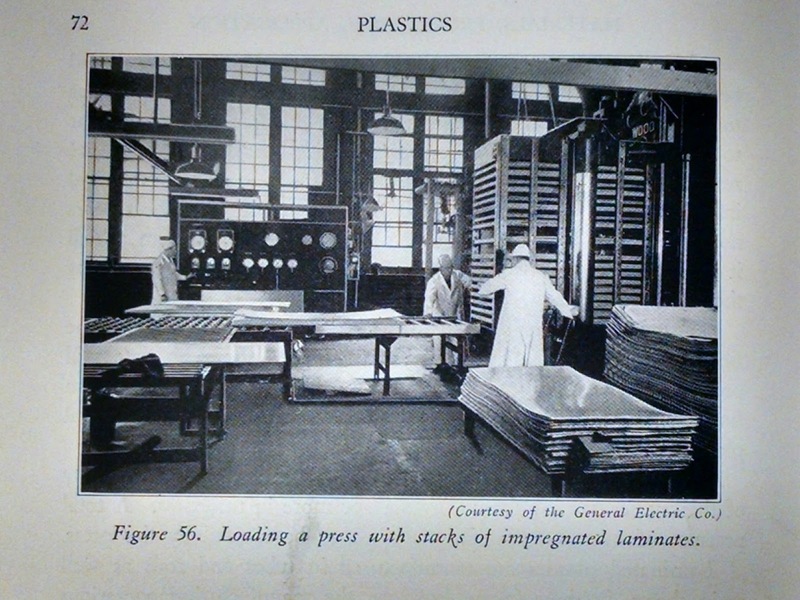 In 1926, Dr. Goldschmidt developed the Tego process for manufacturing plywood articles. Practical commercial bonding of plywood with synthetic resins began with the introduction in this country (USA) of a Phenol- Formaldehyde resin in sheet form, first manufactured in this country in 1935 after several years of successful service abroad. 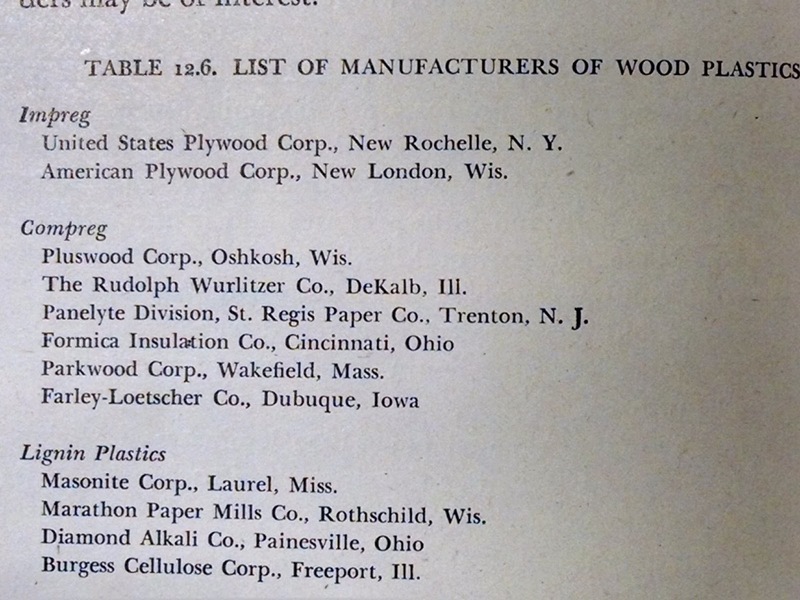 In 1941, the Forest Products Laboratory of the U.S. Department of Agriculture, located at Madison Wisconsin, was given a million dollar grant for research on wood products. Net result: two new kinds of plywood material, impregnated wood, called Impreg, and compregnated wood, called Compreg. Impreg is plywood that has been given a bath in resin under pressure which forces the resin into the wood cells where it enters into a molecular alliance with the molecules themselves. Compreg is also given a bath under pressure, but the pressure is stepped up to 250 pounds per square inch. The American Compreg is made by applying the resin in the Phenol-alcohol stage of condensation and the smaller, more highly polar molecules penetrate into the cell walls of the wood. The result is substantially a new material- neither a plastic or a wood, but with the beauty of the wood's grain and texture, yet possessing the fire, heat, moisture, and bacterial-resisting virtues of a phenolic plastic." "Pregwood is another Formica developement with great possibilities. This is a product in which laminations of actual wood are impregnated with Phenolic resins and pressed into solid sheets. This tough material has also been used for Military skis. 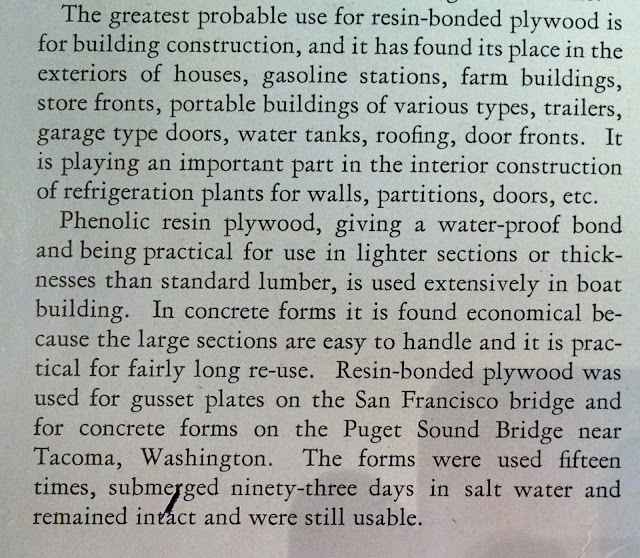 Phenolic plywood resins were turned out at an annual rate of about 36,000,000 pounds. This was used to make approximately 600,000,000 square feet of 3 ply material use in boats, hutments, decking, gliders, and power aircraft, etc..
One of the strongest plastics products is Pregwood, an impregnated wood. Pregwood has a tensile strength of 30,000lb. per sq. inch. Pregwood actually shows up better on this basis than chrome- molybdenum steel with 22,900, or Aluminum alloy, at 22,100." More Phenolic plastics were made for this purpose than any other. 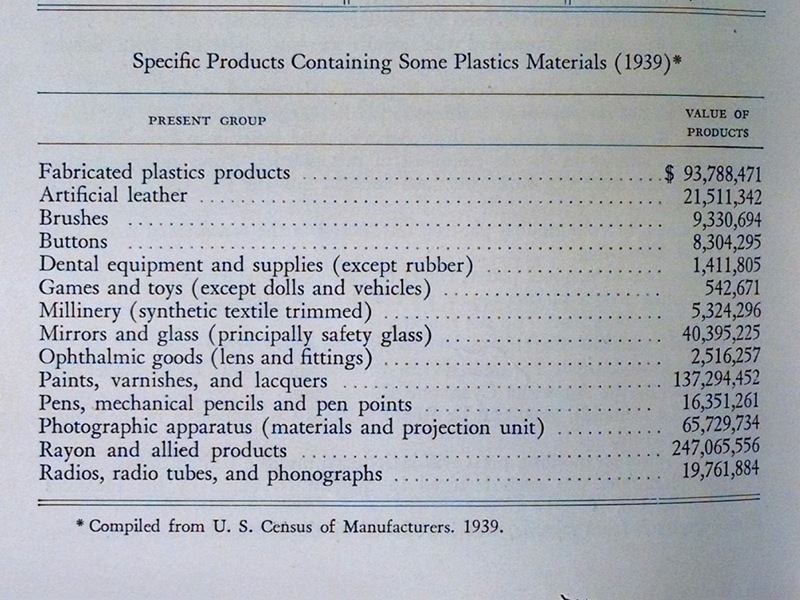 "Production of all plastics materials in 1944, according to the War Production Board, was about 800,000,000 pounds. of this, over 400.000.000 pounds was in structural or rigid plastics. Resins for the paint, varnish, and lacquer industry; this is probably the largest single outlet for the plastics industry." When polymerizing the laminate formulas, they are completely hardened. This is different than Jewelry grade Phenolics, which are not completely polymerized because they would be too brittle. Bakelite that has seen a lot of heat cracks and breaks easily. That is why a lot of flatware is split at the point where the metal shank was inserted. "Complete house, inside and out, is constructed of Resnprest Durez bonded plywood. 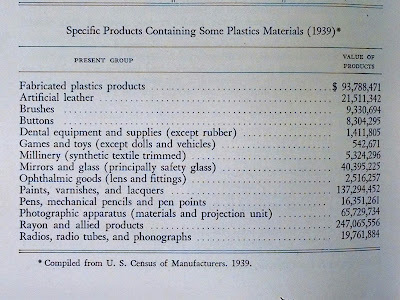 Note the smooth rounded surfaces"
"Of course, only thermoplastic materials have value as scrap, since they can be melted down, and used again, whereas the thermosetting materials have no further value after once being used. However, scrap materials will doubtless continue to be made and sold for technically unimportant parts or consumer goods. 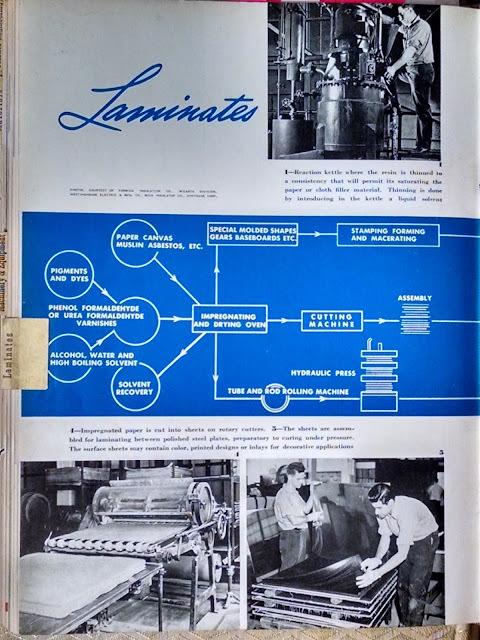 Like most processes, laminating is most economical when done on a large scale." 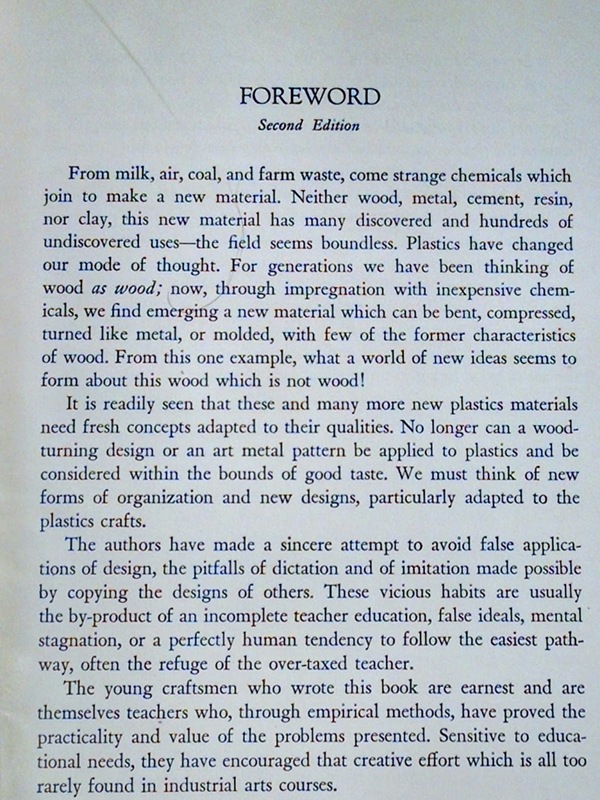 I believe that most of the laminated Phenolic jewelry was made from scrap, since it was never mentioned other than as a "novelty" in the many books I've read about phenolics. Belt made from Phenolic impregnated wood. Earrings made from "Bakelite" impregnated, laminated wood. 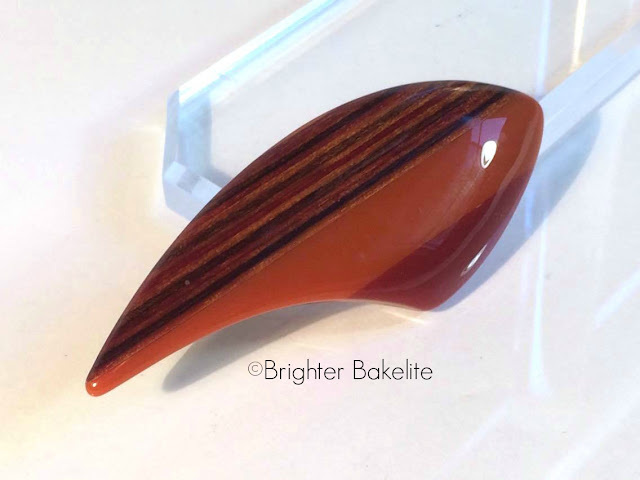 Mid Century Modern Brooch of Phenolic laminated woods and Lucite. 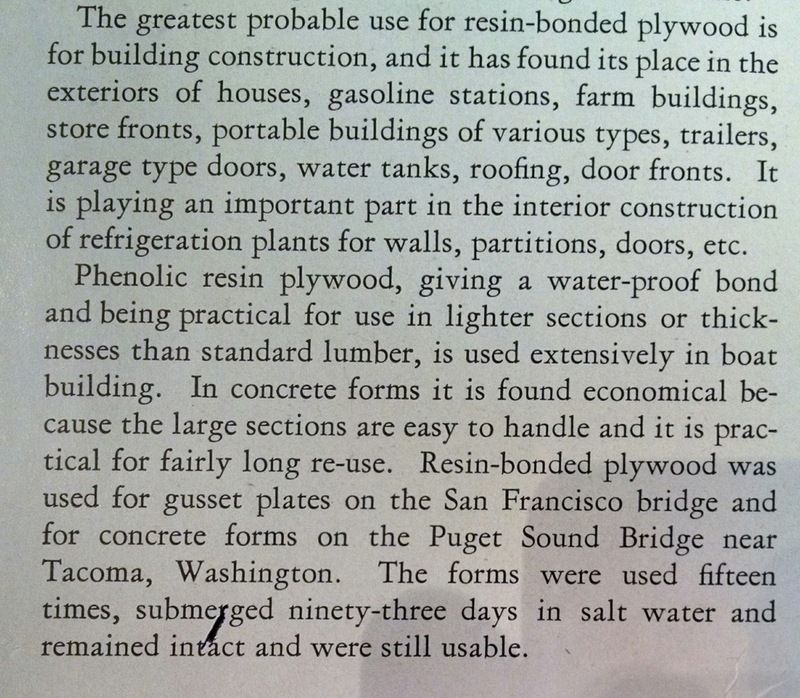 Many planes were made with Resin bonded wood, mostly Spruce. 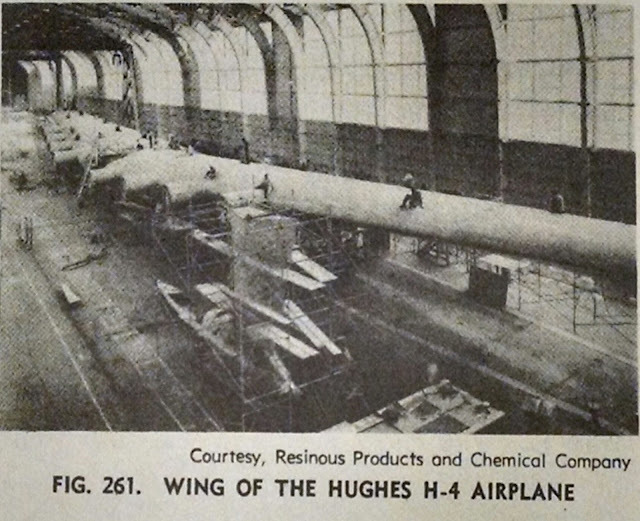 This is how the "Spruce Goose" got it's derisive nickname by the media, although it is made mostly of Birch. Timm Aircraft training plane built of phenolic resinoid bonded plywood. If someone in your family flew for the Military in WWII, they most likely had been in, or flew a Bakelite plane! "One of the most unusual applications of the resin bonded plywood is in the construction of the Hughes H-4 airplane." The largest piece of Bakelite in the world! You bet I rubbed and smelled the plane! Unfortunately, it didn't test positive because of the paint. I did smell his sample piece of laminate that was bent in an L shape. 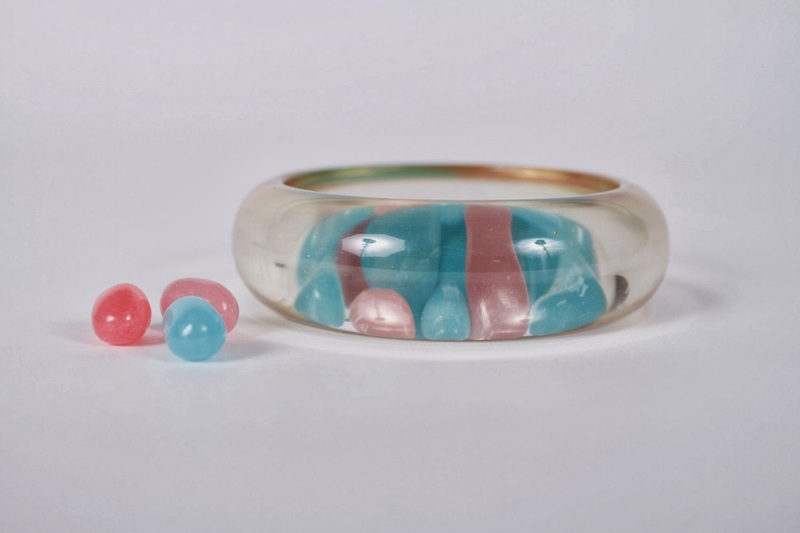 He thought I was weird, and didn't really get what I was saying about jewelry and such made of Phenolics. 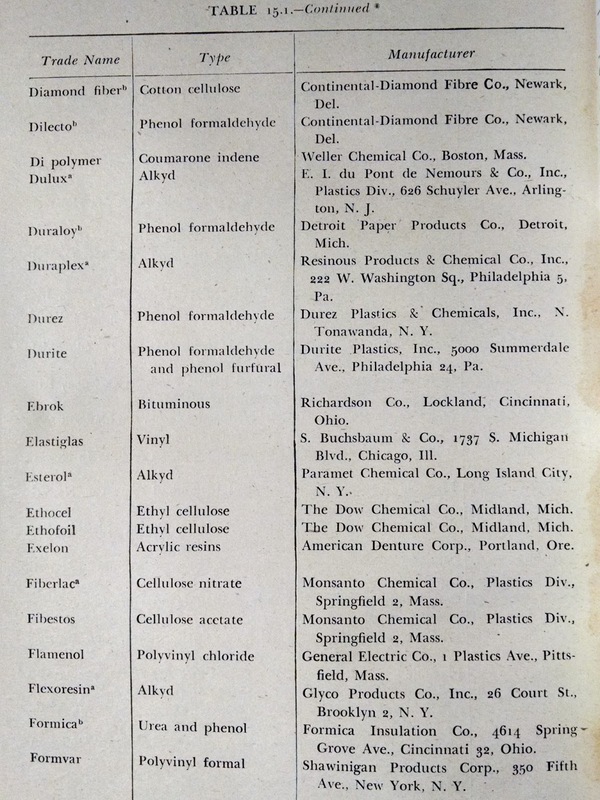 "Duramold is a composite material process developed by Virginius E. Clark. Birch plies are impregnated with phenolic resin, such as Haskelite and laminated together in a mould under heat (280°F) and pressure for use as a lightweight structural material. 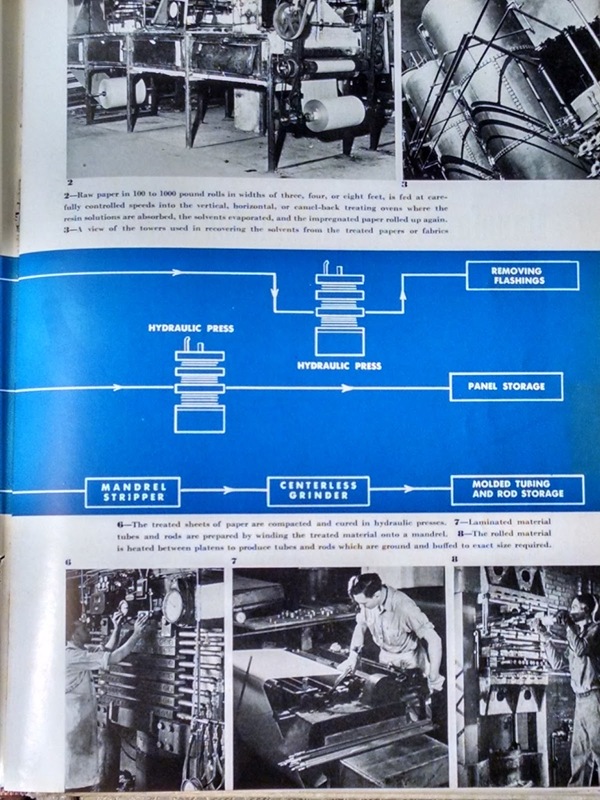 Similar to plywood, Duramold and other lightweight composite materials were considered critical during periods of material shortage in World War II, replacing scarce materials like aluminum alloys and steel." - Evergreen Aviation Youtube video of the H4. As a side note; the Engineer I spoke to was the fourth person to know that this plane was going to fly. 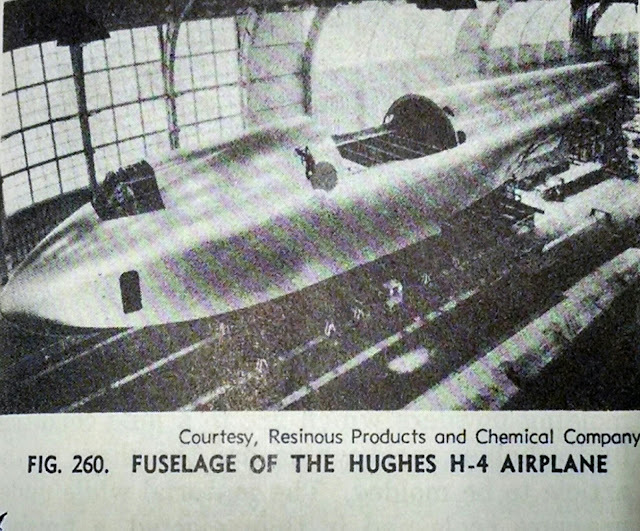 Howard Hughes didn't tell anyone so that there would be no chance of stopping him. As they were taxiing across the water, the engineer was in the tail of the plane with the operator of that section. 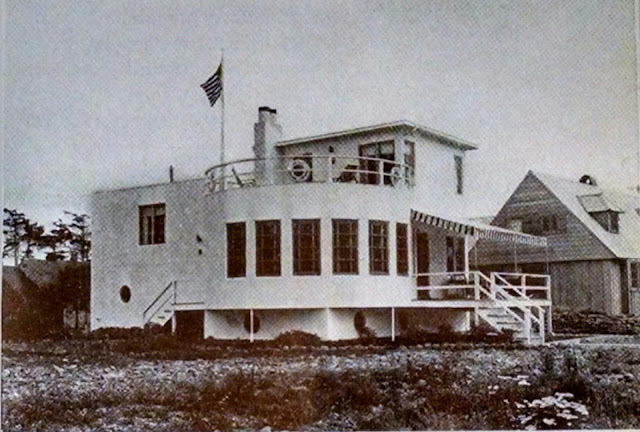 At that time, they didn't have the technology to physically connect the cockpit controls all the way to the tail of the plane, so he had to radio a man and tell him how to move the rudder and elevators. 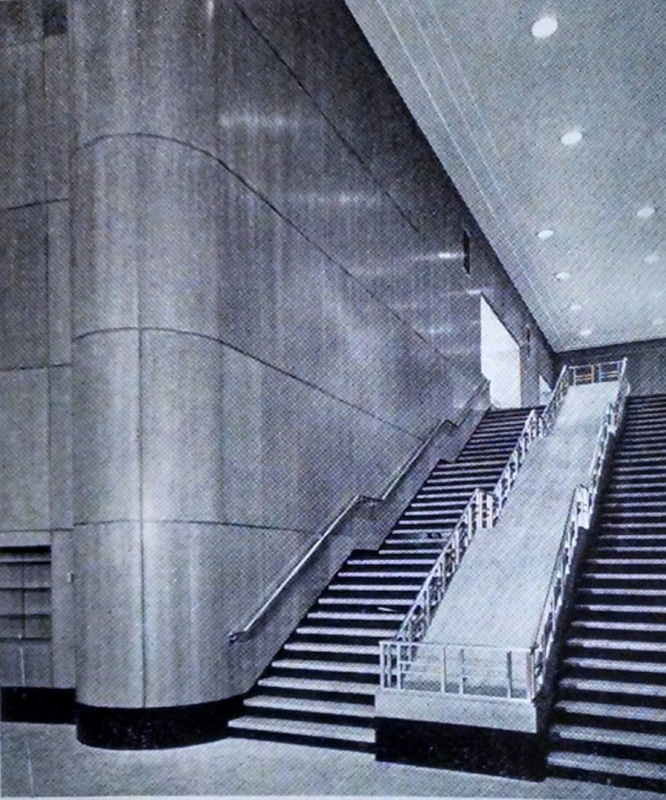 When he gave the signal to set the elevators at a certain angle, he turned to the engineer and said "Hang on. We are going to fly!". It makes perfect sense that people saw the beauty in the scrap, just as they did with the overspray that built up from painting cars, and made jewelry from it. I love my job, and enjoy digging up these little to unknown facts about Phenolic resiniod jewelry! 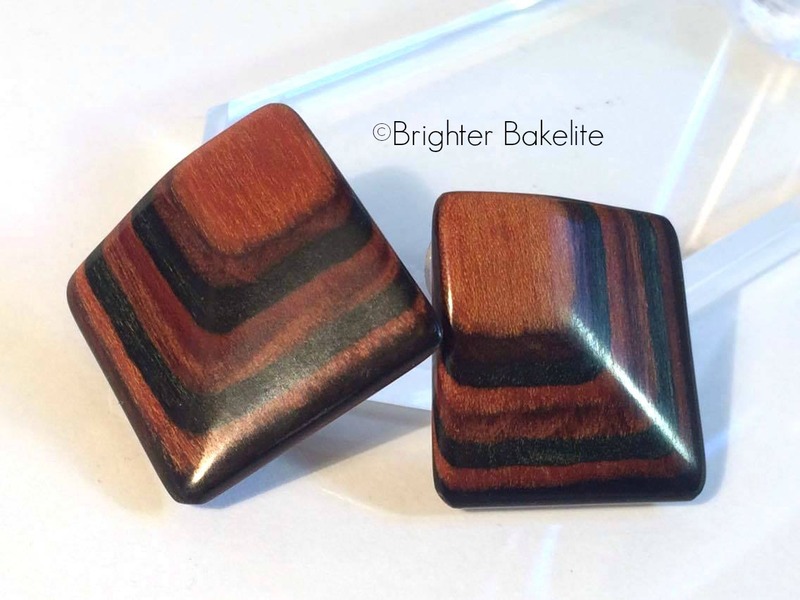 For more fine examples of these and other Bakelite jewelry check this out! Thank you for reading and supporting my love of this material! "Camo" Bakelite: Actual Bakelite, Car Paint, or what? Hello all! In an attempt to get this blog back on the road, I wanted to share some info on the ever-elusive and rare"camo" bakelite. "Camo" Bakelite pieces are well sought after, and valuable because they are so different from other Bakelite. You probably know this and either have, or want one... but, no one really knows what it is because it doesn't test the same, smell the same, or feel the same as other Bakelite. Maybe you have heard the rumor that it's automotive paint..
Well, I'm not going to make you read the entire blog to get to the answer.. So.. is it actual Bakelite, or car paint? 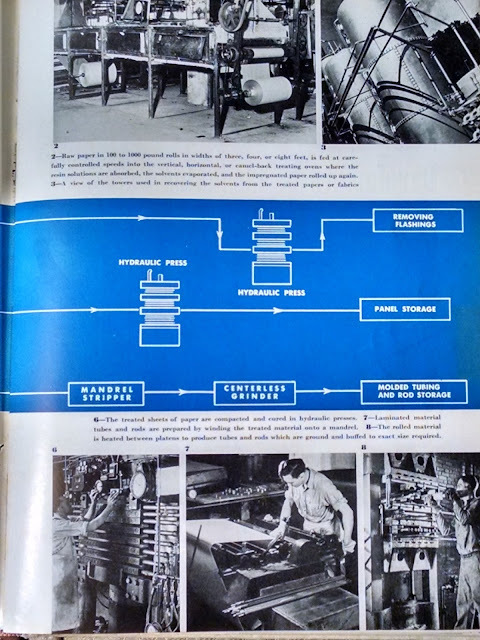 In the 1941 book that this photo was taken from, there are many manufacturers that bought the rights to the Bakelite formula, and have have come up with their own patented and named versions. 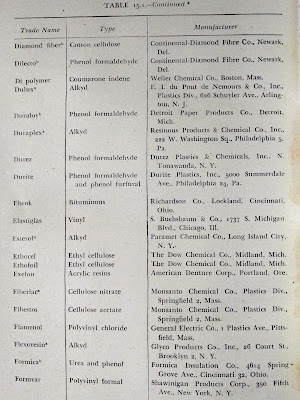 From a 1946 book about the Plastics industry, which has an extensive list of all of the manufacturers at that time. The Durez Corporation was very prolific in the 1930s, switching to the War effort, as everyone did. 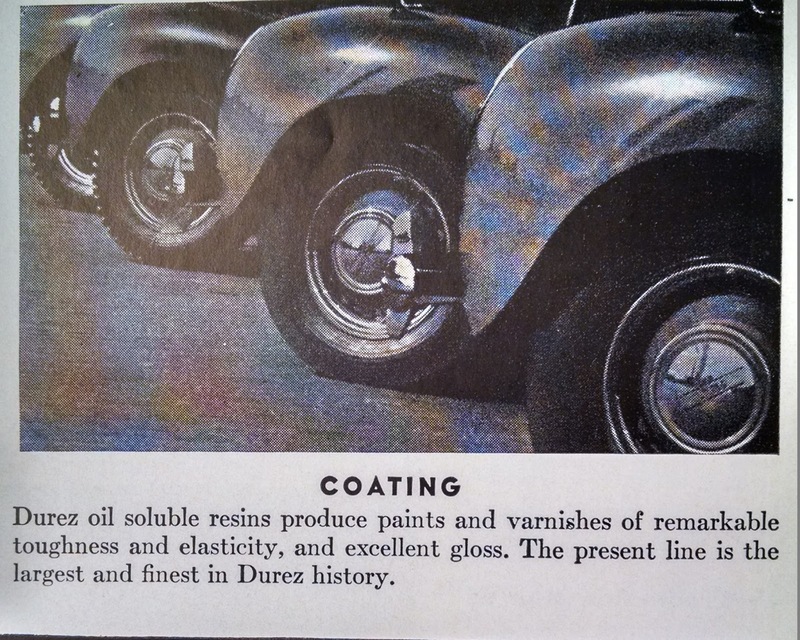 They manufactured many Phenolic resin products, but were best known for their paints. Before you read on, I must state that I don't have direct proof of what I state in this blog. 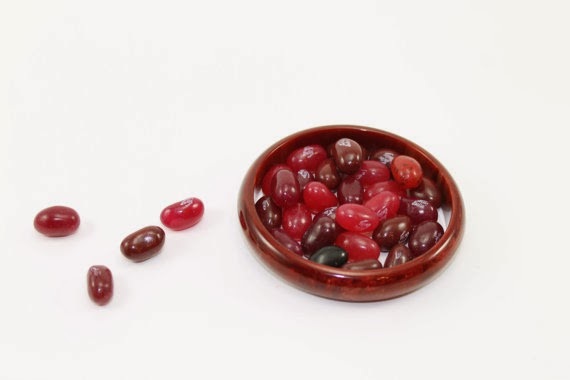 Information about Bakelite in general is scarce, and has to be pieced together by enthusiasts like myself, so I will explain how I came to my hypothesis, and conclusion. When I first saw these pieces, it immediately reminded me of doing body work on old cars. I grew up in my Father's mechanic shop, and worked there throughout my childhood. When a person sands through layers of paint, they get this "Camouflage" effect, as the higher layers of paint get sanded down. It's like a topographical map, with the layers being different colors. Next, I recognized the smell of 1930s paint, also from working on cars. It is a specific sort of dried/ hot plastic smell, but somewhat organic. Also, I have only seen these pieces in the colors that cars were painted in the 1930s. 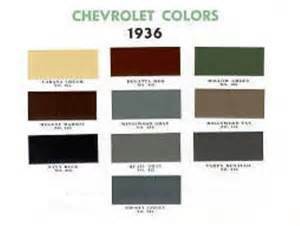 There were a few variations, but these are the typical colors of Automobiles at the time. Another clue that these jewelry pieces are layered paint is that there is no adhesive between the layers, and the layers are uneven; hence the topographical map striation. Even on pieces like brooches and beads, where most of what you see is the striation, you can see that the layers are inconsistent. From my personal Bakelite collection; A few things that I get to wear! I believe that the round spots on the bangles is where the drip accumulated after they were dipped. That creates the high spot, and all of the layers on top of it get sanded away. I have seen on several pieces what looks like a line where there was a wire that held the piece as it was dipped. This "Wood Grain" style would have been done tube style, and the sliced, revealing the striated layers. This would have been a labor intensive process, and that would explain why there aren't many of these pieces around, and why most of them that I see are the cut striation type. The latter type could have been poured in large sheets and cut up, rather than dipping each piece individually. There are sometimes bubbles in the formula, that also indicate a quick drying process. Other Bakelite material generally has time for the bubbles to reach the "flash" material at the top, and not become part of the final product. In my research, I found "Fordite", also known as Detroit Agate, and Motor Agate. Cars used to be hand painted, and the overspray, and drips would accumulate on the sled and rails that the car body was put on to be pushed into a curing oven. After many repetitions of this process, the paint would build up to the point that it got in the way of the process. Since it is a hard substance, and built to a thickness of many inches, it had to be broken off. This would expose the beautiful layers of different colors. The factory workers took pieces home to work with, and created the genre of new material. They were random chunks at this point, and someone got the idea to purposely make jewelry from it. I surmised that they way that would make the most sense, and by the formation of the layers, that it would have started with a bangle shape that was dipped in the paint, creating a new layered hue each time. I have yet to find any direct information about this process, but I think it's a solid hypothesis, and is illustrated by one of my pieces that has a chip and some surface cracks. The chip reveals the solid piece that was dipped in the layers of paint. I have yet to find out if this process was done in a factory, or by a craftsperson. As always, I welcome additional information, or correction! This was just one of those mysteries that I had to figure out..
For beautiful Bakelite pieces like these, please visit https://www.etsy.com/shop/BrighterBakelite and be sure to look through what I have sold in the links on the left. My best pieces sell within minutes. I'll try to post interesting Bakelite related information regularly. 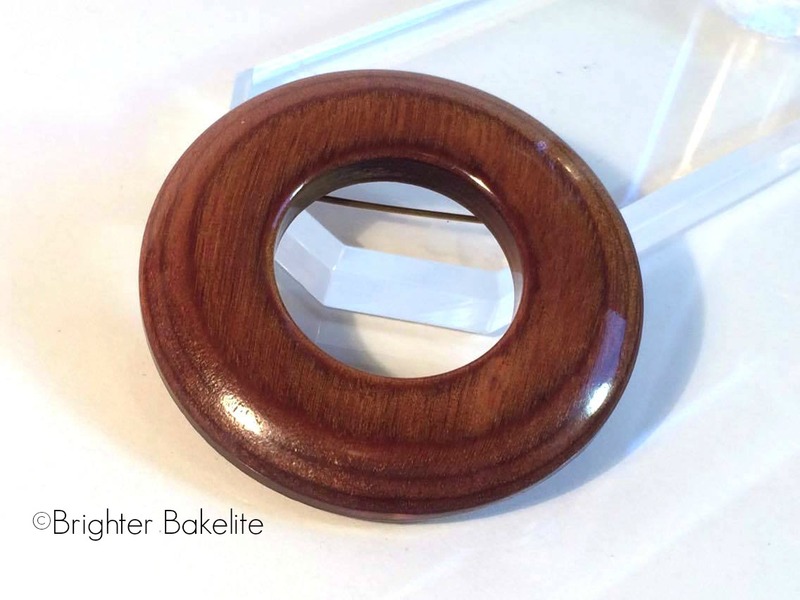 How Brighter Bakelite got started.. I am finally blogging. Be patient, as I am not a computer person, and have not blogged before. The time has come to just Do it! I have hesitated to write because I don't know where to start. The intention of this blog site is to provide a lot of information that I have learned over the years through a lot of research and curiosity, and genuine love of the material. Ever since I can remember, I have shopped at thrift stores. The only time I had new clothes was for my Grandmother's funeral, and I didn't like them. One of the things that I noticed and liked was Bakelite. It was everywhere in the '80s! If I had the means to store it, I would have amazing huge Bookends, Lamps, Desk sets, and everything that was made from it. Fast forward to about 4 years ago, when I worked for a prominent vintage and antique clothing company. My main duty was repairing clothes, as I have been sewing since I was young. I branched out into repairing shoes, hats, and accessories. 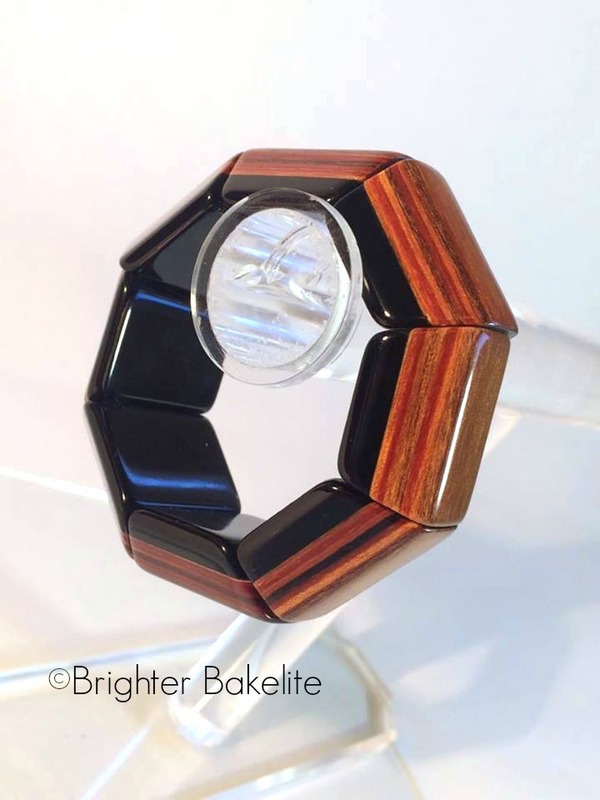 My partner had an impressive Bakelite collection with a few pieces that our friend had refinished for her. I thought "I could do that". She gave me two pieces to work on, and it went well, so I bought some tools at a yard sale. She was reluctant to have me do any more, since she was very used to how they looked.. but... she had me do a couple more, and a couple more, and as the amazing colors emerged, she told her friends, and I was onto something! Now, let's back up to how I was confident enough to go for it.. I have always liked polishing things, and did it as a hobby. I worked with stone, metal, and wood. In fact, I was a woodworker in my early 20s, and had a carved Armoire on the March 1994 issue of Phoenix Home and Garden magazine, which was a special issue called "Masters of the Southwest". My specialty was antique reproduction, mostly Old World style. I have also worked with blown glass, stained glass, and various other materials. More recently, I made custom parts for cars out of plastics similar to the Bakelite formulation, and even have some Bakelite pieces in the engine of my race car! My friend and I built a mobile dance club out of my 34 foot Winnebago that had a clear plastic (Lexan) upper level dance floor. It was 27' by 8' and supported a lot of dancing people! When I decided to make a business of this, I learned everything I could about Bakelite, and consulted my good friend who is a Master chemical engineer with a high position at Intel corp. I never liked the idea of sanding Bakelite, and using metal polish chemicals on it, so I devised my method. I have refined it over the years, and added UV protection, and got the idea of the anti tarnish bags because I didn't like that they would patina again quickly (especially with sanding). I now have original equipment from the Bakelite factories and have studied how it was made, carved and finished. I have collected books on all of this, mostly from people who have worked with it many years ago. I also have collected stock Bakelite rods, tubes, and factory pieces, as well as the original hardware and findings. This is in my blood now (maybe literally), and I think I will do this for the rest of my life. Since you are reading this, you are supporting me and I thank you!! Bakelite. The colors, the sound, the weight. What is not to love? 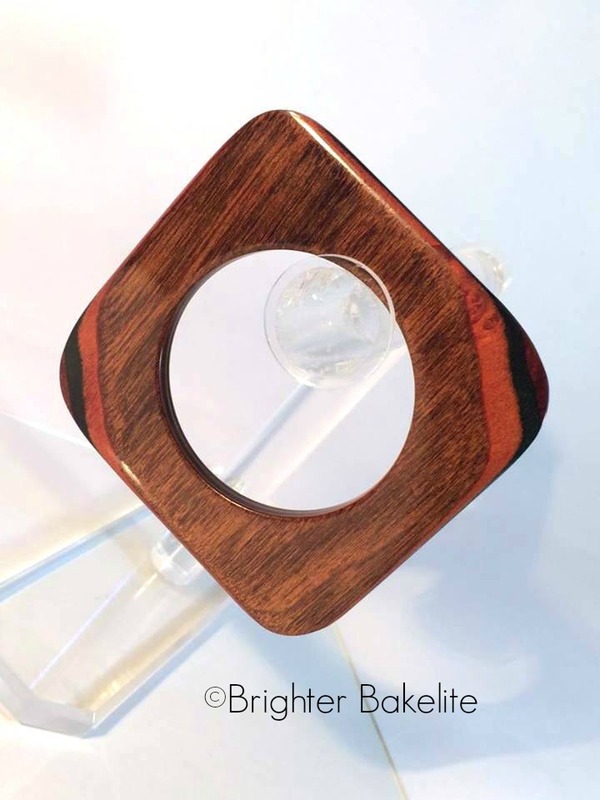 We didn't set out to change the face of Bakelite collecting. We don't claim that polished is superior to patinaed. We just set out to discover what it used to look like, and to expand the colors in one single collection through the process of restoration. Suddenly, there was Brighter Bakelite. We love it, and found that a lot of other people do, too. No wonder so much Bakelite was made! It came in every color of the rainbow, and could be matched with every ensemble. It has been a lot of fun, and a very interesting journey. This blog will talk about a lot of different aspects of Bakelite, polished bakelite, identification. But for now - we just want to show off some of the amazing colors we have discovered over the last six months.